Costa Mesa Shutters, when this customer bought his new home in Costa Mesa, CA he was not sure when type of window treatmeant would be right for the numerous openings he has in him home. 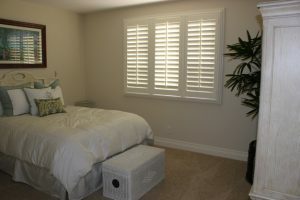 After much research and many sleepless nights he came up with the solution of custom Costa Mesa shutters. At first he was just going to start out small and only do a few windows since he had gotten a couple other estimate and felt that his budget would only allow for part of his home. Much to his surprise after meeting with Orange County Shutters he found out that quality doesn’t have to be expensive. He was so pleased with the high end look of our Costa Mesa shutters and the budget friendly pricing that he decided to put Costa Mesa shutters in all his windows throughout his home. Since tradition and clean lines are his decorating taste we were able to come up with the perfect blend of standard features that enhances the look of his home with charm and beauty. We decided that the 3 1/2″ louvers were the best choice in louver size for his windows. They brought in just the right amount of light to have a soothing and comfortable glow in every room. Also the louvers were the perfect size to give him ample privacy from passers by. To enhance the traditional look of the Costa Mesa shutters that the customer loved, we chose the timeless look of the standard tilt bar. The center positioned tilt bar that features stainless steel 3/4″ staples not only looks great, but will last a lifetime. The framing that we chose is the classic Z large. With the convex details in the wood it created a molding effect around the windows making each opening look like a work of art. The framing also worked out perfect for the customer since it has a very low projection from the wall. That was important for himbecause that meant he could still keep his furniture close to the wall and the windows, opening up his living area. We were so proud that in Costa Mesa our shutters brought tradition to this new home.